Translation: Nozomi Suzuki and also in Mexico for a myspace show. We hold of them somewhere between Spain and Germany to talk about the past and how things has developed so far. We met in Copenhagen back in the late nineties through mutual friends. Then started playing together in 2000 and released whip it on in Denmark in 2002. Then and now, how is it in Copenhagen when you aim to play in a band? Denmark has good financial support of culture, that is the very positive thing. The difficult part can be finding your audience with music that is more alternative since there is only 5 million people altogether. So we had an urge to seek outside of Denmark and have lived in London, New York and Los Angeles for the last 8 years. What have changed in how you record between “Whip It On” (2002) to “In And Out Of Control” (2009)? All our albums have been different. “Whip It On” was recorded in a studio that we borrowed at night when there were no sessions. So we could get it for free. “Chain Gang of Love” was recorded at home and all the vocals done at a big fancy studio in NYC. “Pretty In Black” was done at an even bigger residential studio close to Woodstock. More of a traditional production. “Lust lust lust” was done completely low-fi at home in NYC, LA and Copenhagen. And this last one was done in our producers studio in Copenhagen. But kind of a big production done fast and spontaneous so it has a very low fi approach and attitude but with many layers. What do you miss from Copenhagen? I mainly miss family and friends. Then I miss riding my bike through Copenhagen. I miss the long summer nights, the cold air, the snow. Some good tips for our readers about to do in Copenhagen. The Smørrebrød (open faced sandwiches). The picnics in the park. 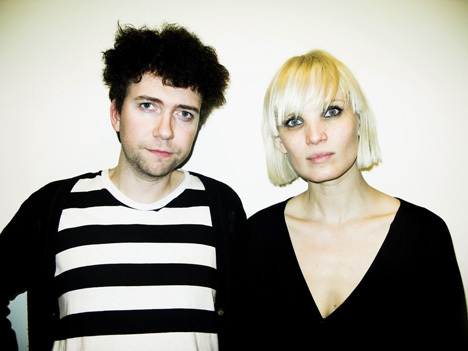 Some places where Raveonettes has played in town are Grand Café (Ahlgade 48) and VEGA.